Where does the interior of a home stop? Where does the exterior begin? Interior designer Pamela Pierce’s 1926 stucco manse in Houston’s Museum District. Interior design by homeowner Pamela Pierce, Pierce Designs and Associates. Photography by Laura Resen. “Well-Lived: Pamela Pierce’s Houston House” by Frances Schultz. Veranda. “Sofa in Christian Liaigre white linen. Song Dynasty table lamp, Watkins Culver. 18th-c. French fireplace. Saarinen table, Sunset Settings.” Interior designer Pamela Pierce’s 1926 stucco manse in Houston’s Museum District. Interior design by homeowner Pamela Pierce, Pierce Designs and Associates. Photography by Laura Resen. “Well-Lived: Pamela Pierce’s Houston House” by Frances Schultz. Veranda. 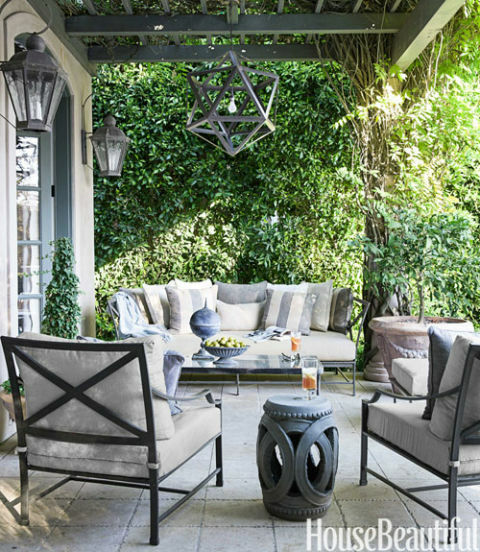 Many homeowners today are opting to create more living space by turning their backyards and porches into outdoor rooms – complete with cushions, lamps, and rugs. Home in Blowing Rock, North Carolina. Design by Will Merrill Designs. 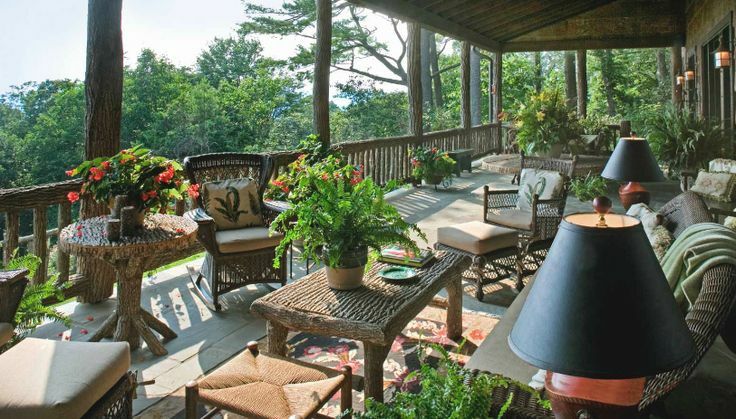 The photo above depicts a porch that functions as an outdoor room with a beautiful mountain view. The tables and porch railings repeat the texture of the surrounding trees – visually connecting the space to its surroundings. Outdoor fabrics provide color and comfort to wicker furniture. 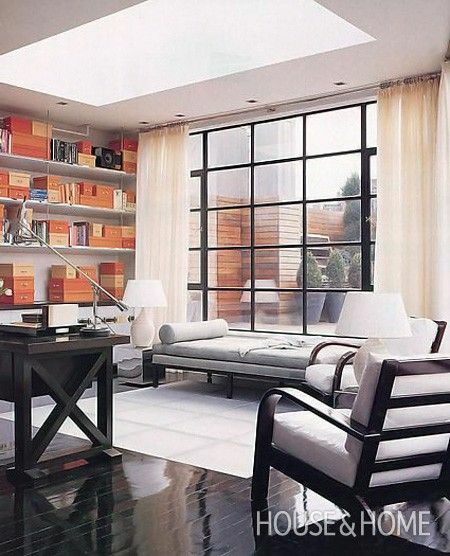 “Large, factory-style windows add drama to this airy, light-filled space designed by New York-based interior designer Steven Gambrel. Low furniture keeps the space open. Orange storage boxes displayed on shelves reference the slatted wood wall seen through the window, creating a connection between the indoor and outdoor rooms.” “Photo Gallery: Indoor – Outdoor Spaces,” Canadian House and Home. “Grosso’s simple color scheme continues in the master bedroom where texture and pattern add interest. The shade of gray in the Kravet fabric enveloping the bed harmonizes with terrace walls outside. A Baker chaise covered in silk mohair provides a spot to relax. 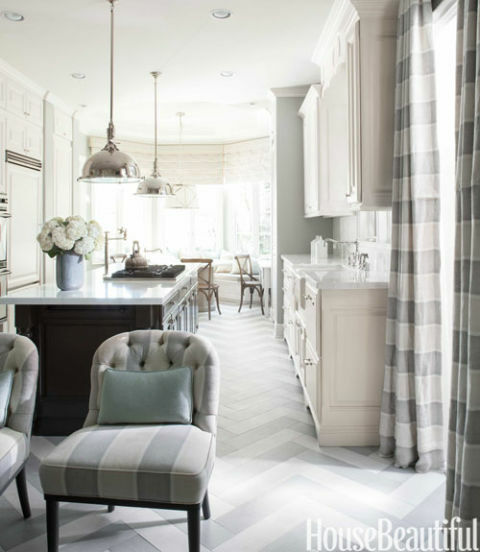 An antique Oushak carpet is delightful underfoot.” Interior design by Kellie Grosso. Photo: John Granen. “Before and After: Casual California Home” written by Lisa Cregan. Traditional Home. 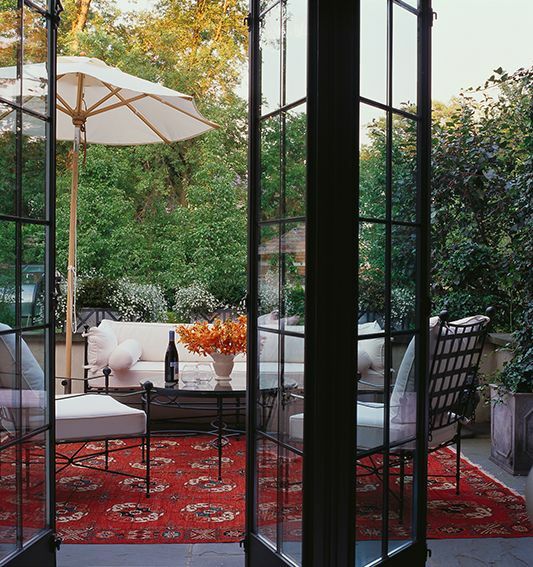 “Janus et Cie umbrella and iron furniture. Windowed steel doors manufactured by Hope’s. Sisal rug. Table flowers by Ex Floreus of Lake Forest.” French Norman-style manor house near Lake Michigan in the Village of Lake Bluff, an historic Chicago suburb. Interior design by Gail Plechaty, Real Simple Design. Landscape design by Dorothy and Barton Herbert. Photography by Janet Mesic Mackie. Styled by Hilary Rose. Text by Dana Micucci. “Chicago Harmony” Veranda. Outdoor rugs come in a range of prices. Janet Brown advises homeowners to purchase outdoor rugs without a backing; a latex backing can cause mildew because it will prevent a wet rug from draining. “Lacquered walls in an intense apple green are enhanced by a mix of furniture and eclectic touches.” Interior Design: Julie Hayes. Landscape Architecture: Paul Fields. Architect: Larry E. Boerder Architects. Photo: Max Kim-Bee. Styled by Mary Jane Ryburn and Olga Naiman. Written by Jennifer Alfano. “Color Balance” produced by Mary Jane Ryburn. Veranda (November – December 2011). “The new loggia picks up the green scheme from the adjacent living room, unifying the inside with the outside. 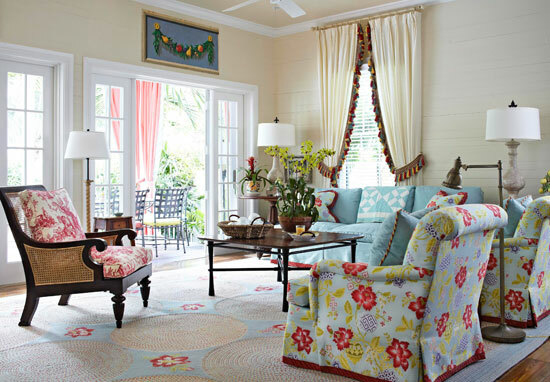 Pillows and cushions in Sunbrella fabric.” Interior Design: Julie Hayes. Landscape Architecture: Paul Fields. Architect: Larry E. Boerder Architects. Photo: Max Kim-Bee. Styled by Mary Jane Ryburn and Olga Naiman. Written by Jennifer Alfano. “Color Balance” produced by Mary Jane Ryburn. Veranda (November – December 2011). The green pillows and cushions pictured above are made of Sunbrella fabric, which can be washed and bleached. Janet Brown uses white Sunbrella pillows and cushions outside her home; when they become dirty, she soaks the covers in her top-loading washing machine, and they look new again. 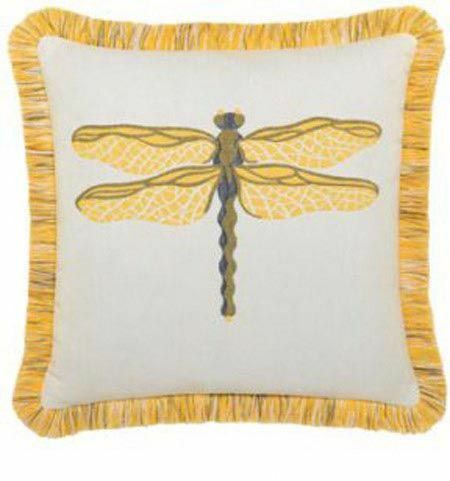 Indoor – outdoor dragonfly pillow available via Janet Brown Interiors. Janet Brown sells many indoor-outdoor pillows, as well as outdoor fillers. An indoor filler (such as down) in an outdoor pillow will cause the cushion to mildew from the inside out. 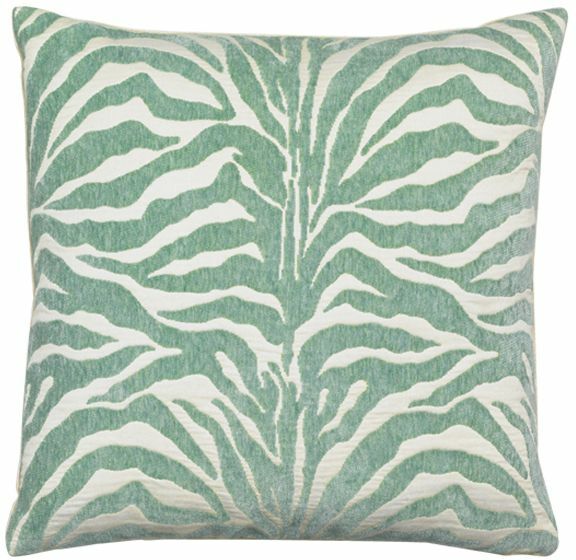 Indoor – outdoor aqua zebra pillow by Elaine Smith. Available at Janet Brown Interiors. “To keep a feeling of lightness in the dining area, McMakin put a glass top on wicker table bases. On the backs of Bungalow 5 chairs, Schumacher’s Margate Damask linen is laced with simple white cording for a casual look. The floor is honed Herpel tile, original to the 1920s house.” Interior design: Mimi McMakin. Photo: Eric Piasecki. Interview: Barbara King. “Garden Party,” House Beautiful (July/August 2013). 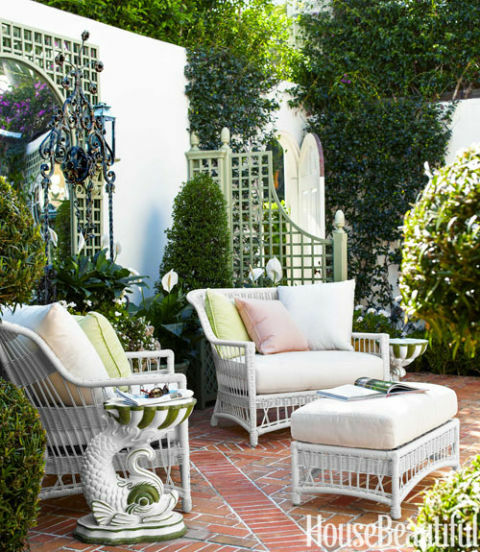 “The Lane Venture settees and ottoman with cushions in Sunbrella fabrics create a cozy nesting spot in the courtyard. ‘Wicker is typical Palm Beach,’ McMakin says. ‘And the new synthetics are a godsend.’ ” Interior design: Mimi McMakin. Photo: Eric Piasecki. Interview: Barbara King. “Garden Party,” House Beautiful (July/August 2013). 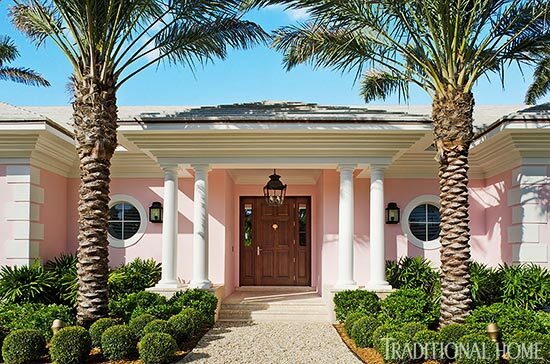 Palm Beach vacation home of interior designer Robin Weiss. Interior design by Robin Weiss. Photo: Robert Brantley. Text: Krissa Rossbund. “Colorful Coastal Home,” Traditional Home (June 2013). 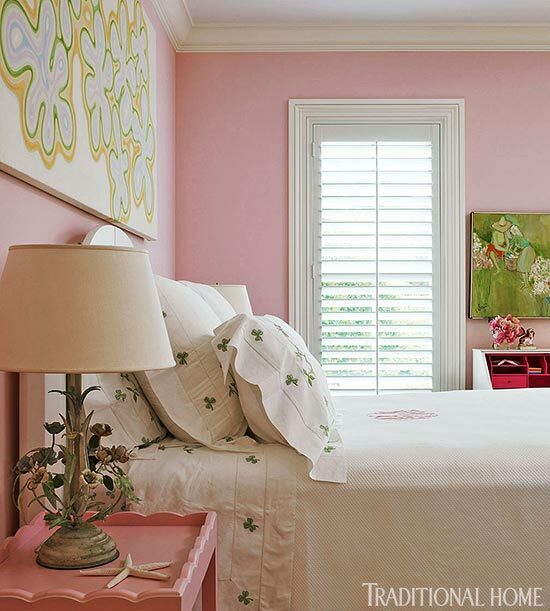 “Quiet pink coats the guest bedroom walls with tranquility, echoing the home’s pastel exterior. The painted Summer Hill bed promotes relaxation with embroidered Yves Delorme linens and a bed cover by Matouk.” [Matouk linens available through Janet Brown Interiors.] Interior design by Robin Weiss. Photo: Robert Brantley. Text: Krissa Rossbund. “Colorful Coastal Home,” Traditional Home (June 2013). “A luxurious Scalamandré floral weave on custom club chairs sets the home’s palette. Sofa fabric is Osborne and Little; drapery fabric is Robert Allen, with custom fringe. Just behind the chairs (not pictured) is the kitchen island. A Visual Comfort floor lamp between club chairs supplements table lamps created from 19th-century Italian balustrades.” Interior design by Todd Richesin. Photo: Werner Straube. “Key West Vacation Home” written and produced by Candace Ord Manroe. Traditional Home (June/July 2010). “The great room’s petite 18th-century French table and the Pierre Frey toile-covered British Khaki Collection lounge chair segue to the porch’s Brown Jordan rattan sofa covered in a Lee Jofa stripe.” Interior design by Todd Richesin. Photo: Werner Straube. “Key West Vacation Home” written and produced by Candace Ord Manroe. Traditional Home (June/July 2010). 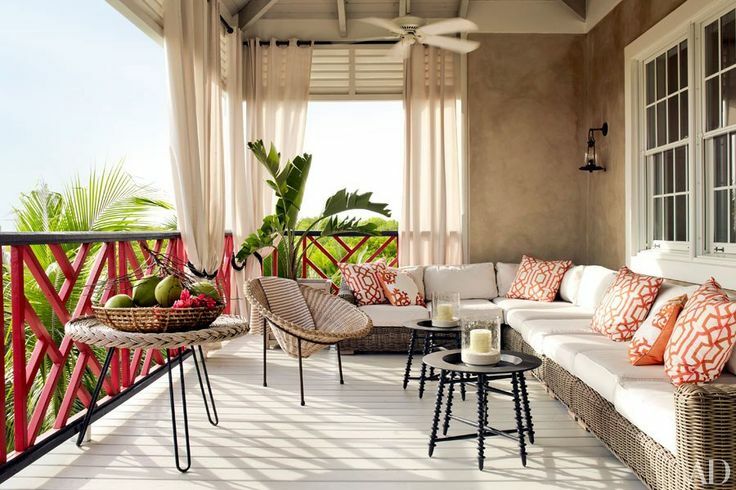 “The veranda is furnished with a vintage French rattan chair and an RH sectional sofa and curtains; the low tables are by IKEA.” Bahamas getaway of designer Alessandra Branca. Photo: William Waldron. Text: Brad Goldfarb. “Island Time” produced by Martin Bourne. Architectural Digest (April 2014). 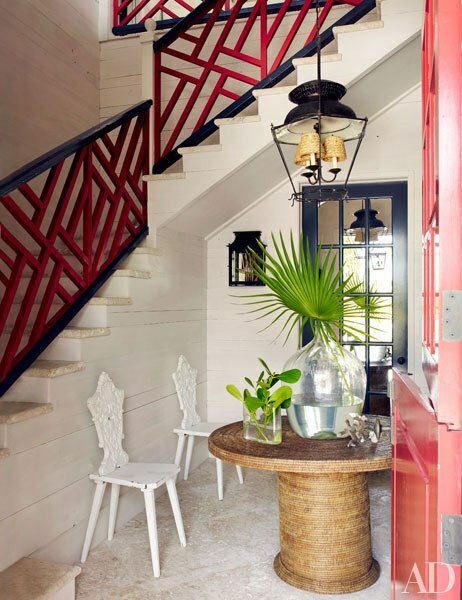 “Pecky-cypress panels line the entrance hall, where a Directoire hanging lantern joins antique Tyrolean chairs and a 1960s table.” Bahamas getaway of designer Alessandra Branca. Photo: William Waldron. Text: Brad Goldfarb. “Island Time” produced by Martin Bourne. Architectural Digest (April 2014). “The living room’s vintage armchairs are cushioned in a Bennison print, and the 19th-century campaign chairs are clad in an Alessandra Branca for Schumacher stripe; a Pottery Barn rug is spread across the coral-stone pavers.” Bahamas getaway of designer Alessandra Branca. Photo: William Waldron. Text: Brad Goldfarb. “Island Time” produced by Martin Bourne. Architectural Digest (April 2014). 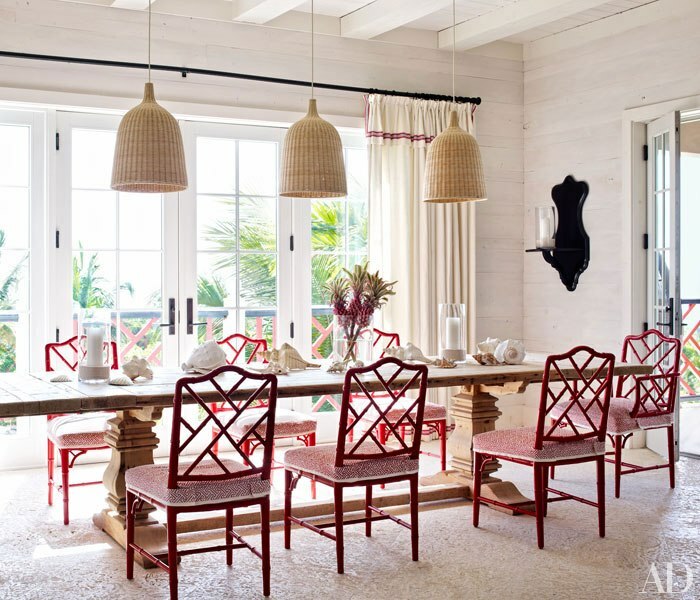 “Vintage chairs surround an RH table in the dining room; the light fixtures are by IKEA.” Bahamas getaway of designer Alessandra Branca. Photo: William Waldron. Text: Brad Goldfarb. “Island Time” produced by Martin Bourne. Architectural Digest (April 2014). “Chinese Chippendale–style railings and a 40-foot-long pool distinguish the Harbour Island retreat; the windows and glazed doors throughout the compound, named Highlowe, are by Andersen Windows.” Bahamas getaway of designer Alessandra Branca. Photo: William Waldron. Text: Brad Goldfarb. “Island Time” produced by Martin Bourne. Architectural Digest (April 2014). 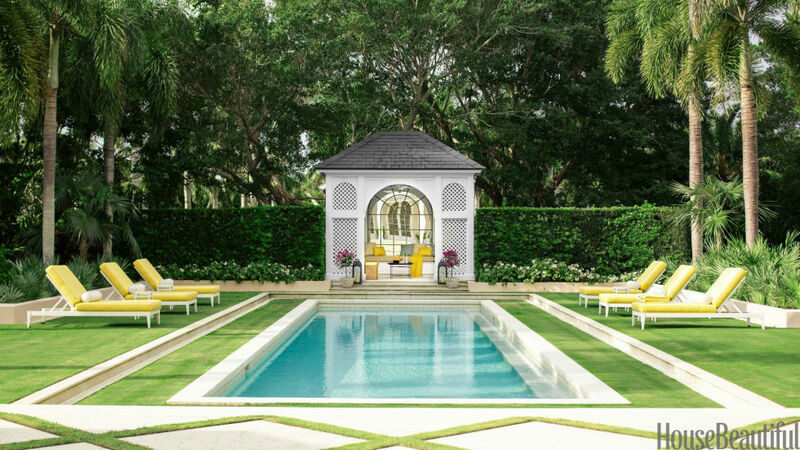 “McKinnon and Harris chaises with buttercup-yellow Sunbrella cushions. [McKinnon and Harris furniture is manufactured in Richmond,] Landscape design is by Ellin Goetz.” Interior design: Carrier and Company. Photo: Eric Piasecki. Interview: Lisa Cregan. “The Sunny Side of Modern,” House Beautiful (September 2013). 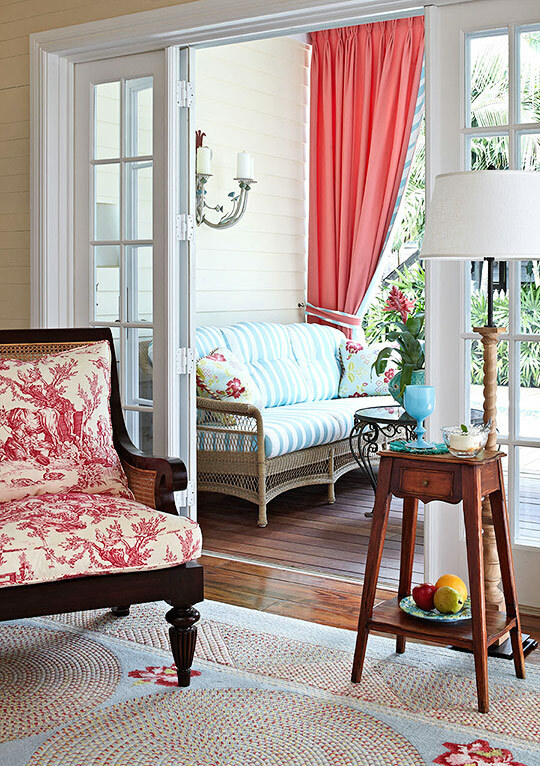 “On the lanai, a sofa in Manuel Canovas’s Tamarin.” Interior design: Carrier and Company. Photo: Eric Piasecki. Interview: Lisa Cregan. “The Sunny Side of Modern,” House Beautiful (September 2013). 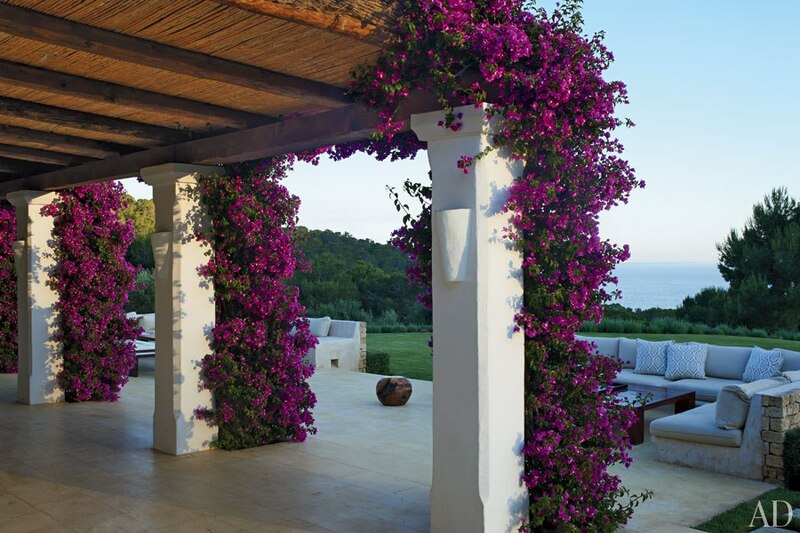 “Bougainvillea climbs the columns of a terrace paved with local limestone; the banquettes are upholstered in a Perennials fabric and enlivened with pillows made of a Christopher Farr print.” Styled by Carlos Mota. Text: Andrew Ferren. “Island Hopping” photographed and produced by Tim Beddow. Architectural Digest (May 2013). “The interiors of the Ibiza residence of Hong Kong–based entrepreneurs Jane and Max Gottschalk were decorated by Audrey Carden of Carden Cunietti. In the beamed living room, the beige linen sofas and the slipper chairs are all by George Smith, the latter upholstered in a Raoul Textiles fabric.” Styled by Carlos Mota. Text: Andrew Ferren. “Island Hopping” photographed and produced by Tim Beddow. Architectural Digest (May 2013). “Industrial-style Restoration Hardware pendants add contrast above the kitchen island. The cabinets are painted in Roman Column by Sherwin-Williams.” Interior design by Mary McDonald. Photo: Amy Neunsinger. “A California House in Soft Shades by Designer Mary McDonald,” House Beautiful. ” ‘The house is on a golf course with manicured lawns, so I liked repeating the grays and ivories of the interior against all the greenery,’ McDonald says of the limestone-tile veranda, which has Restoration Hardware furniture.” Interior design by Mary McDonald. Photo: Amy Neunsinger. “A California House in Soft Shades by Designer Mary McDonald,” House Beautiful. “Awning-stripe Sunbrella fabric keeps seating relaxed on the patio near the sunroom and pool.” Interior design: Ken Gemes. Photo: Tria Giovan. “Tailored to Fit” written by Amy Elbert. Traditional Home (September 2014). “The tub is tucked into a dormer and offers views of the Manhattan skyline. The Roman shade is Plumwich’s hand-screened ‘Quorra’ fabric.” Interior design: Ken Gemes. Photo: Tria Giovan. “Tailored to Fit” written by Amy Elbert. Traditional Home. The design staff of Janet Brown Interiors is ready to help you prepare your outdoor spaces for warm weather living. Historic Garden Week will take place from April 18th through April 25th and offers the opportunity to visit beautiful homes and gardens throughout Virginia, including some houses that Janet Brown has decorated. Tickets are available at Janet Brown Interiors. This is my favorite blog ever. You outdid yourselves. Thank you so much for your kind words! You have made our day.